Wyoming County Soil and Water Conservation District has a long history of working with local municipalities. The District provides a wide range of assistance to municipalities. It may be something fairly simple, like hydroseeding a site. However, some projects are quite involved, with District staff designing and then overseeing construction of the project. 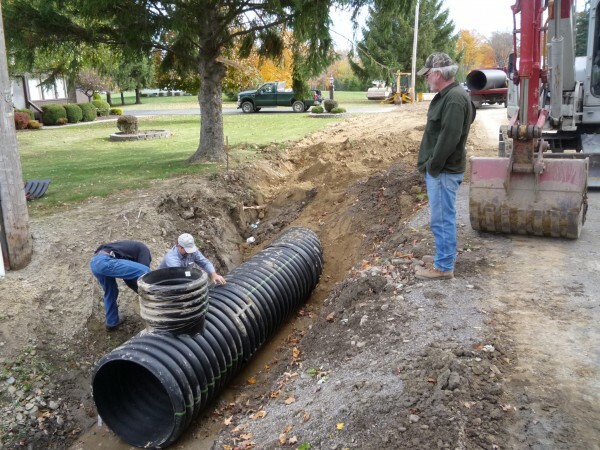 Sizing a culvert may seem like a simple task. However, improperly sized culverts lead to erosion and can cause flooding. Wyoming County Soil and Water Conservation District staff assist highway departments determine appropriate size and placement of culverts. The Wyoming County Soil & Water Conservation District, in cooperation with the Wyoming County Highway Department, operates and maintains a hydroseeding program. The purpose of this program is to assist municipalities and highway departments with a quick and easy method of seeding bare areas such as parks, streambanks, pond dikes, road ditches, and highway construction projects. 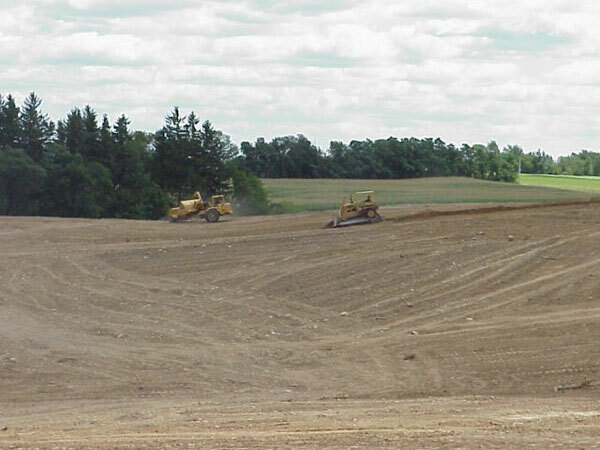 Establishing a vegetative cover is very important in reducing erosion at construction sites, site developments, and other soil disturbance areas. The Hydroseeder is a machine with a large tank that blends a mixture of seed, fertilizer, water and wood fiber or paper mulch into slurry, which is sprayed on the soil. 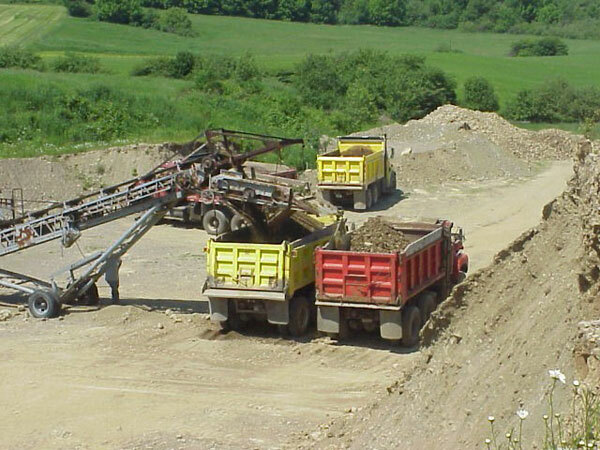 A tackifier is used on the steeper slopes to help hold the mixture to the soil until the seed can germinate. Our hydroseeding equipment mixes up to 950 gallons of seeding mix that covers approximately 10,000 square feet or approximately ¼ acre. 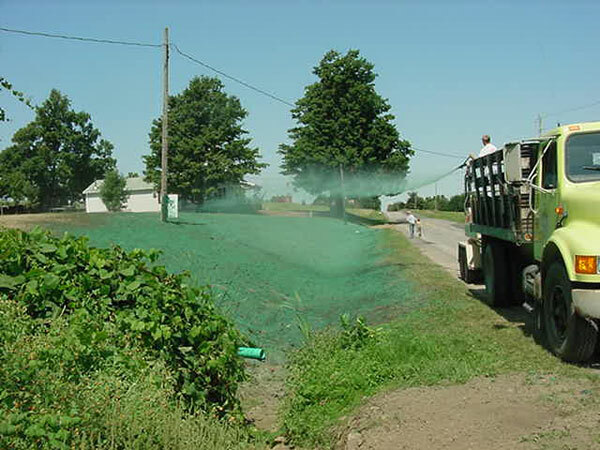 The cost of hydroseeding is a relatively inexpensive method of establishing a uniform cover when the dollars saved in the cost of labor is considered. Our hydroseeding equipment was made possible by a grant to the District from the NYS DEC and the Finger Lakes Aquatic Vegetation Control Program. 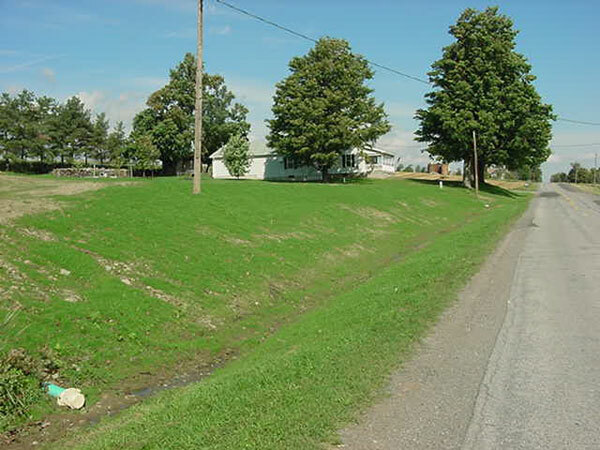 Roadside ditch design and management is important for both driver safety and for water quality. 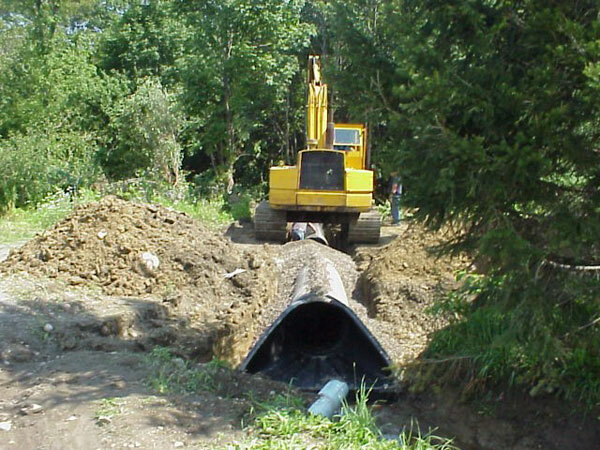 Roadside ditches must be big enough to carry all of the water draining to them in order to keep roads dry and safe. At the same time, roadside ditches must also have stable banks. Otherwise, roadside ditches become a source of sediment and turbidity to local waters. Severe erosion can even lead to damage to the roadway itself. 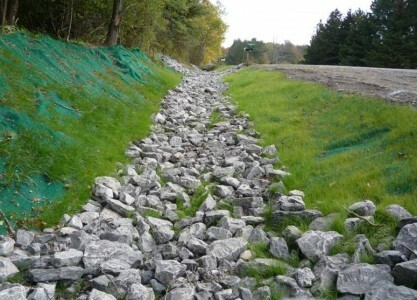 Wyoming County Soil and Water Conservation District has worked with municipalities on many road bank and roadside ditch stabilization projects. Below are just a few examples of recently completed projects. The Luther Grove Road stabilization project was funded through an Erosion & Sediment Control Water Quality Mini-Grant to the Wyoming County Soil & Water Conservation District and the Wyoming County FL/LOWPA Program. Reduce localized flooding issues within this section of the Silver Lake Watershed. Reduce sediment inputs into Silver Lake. 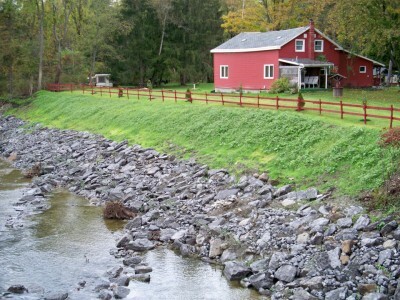 Demonstrate the use of manufactured erosion control products with traditional methods. Club Road had a roadside ditch that was severely eroded and was a source of sediment to Silver Lake. 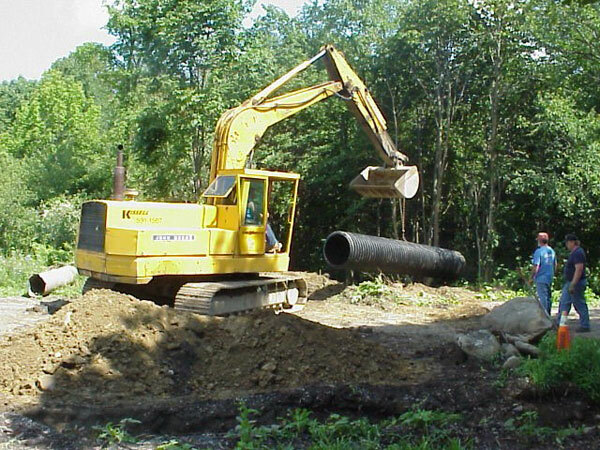 Buried pipes were installed and replaced the roadside ditch. 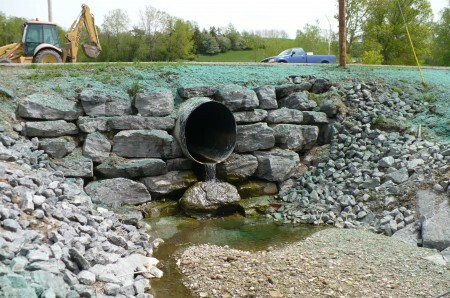 This project helped improve water quality in Silver Lake by reducing erosion. Wyoming County Soil and Water Conservation District assists municipalities with streambank stabilization and improvement projects. Click here to find out more information on our stream programs.